The US Dollar is the most widely used currency in the world. For many readers it is money they use in day to day transactions and that they get paid their salary in. For others it is money they only use when visiting the USA or one of its territories. Millions of people use the USA Dollar every single day, but how many every stopped to think about how it came into existence. First I would like to bring to reader's attention the origin of the word Dollar which gives the best introduction to a history of the US Dollar`. How many people have ever really thought about where this word came from? Most people I ask this question don't know the answer. Dollar is essentially the anglicised word for the German word "Thaler". In 16th century Bohemia there was a place called "Thal", which today goes by the name of Jachymov and is located in the Czech Republic in Eastern Europe. It was here that silver was mined and coined, and it became simply known as the Thaler. As it became very popular not just in Bohemia its use spread throughout Europe. But strangely enough, the name itself spread and was commonly used for other coins that were of similar quality and weight. Through the imperial expansions of many European countries, including Holland, Great Britain, Germany, Spain and Portugal, the different forms of Thaler became very wide spread and known. Similarly today we can encounter US Dollars, Canadian Dollars, Singapore Dollar and many many more. Essentially the word Dollar as a currency has been a household name throughout the world for many centuries, before the official birth of the USA. By the time of the American Revolution, the thirteen colonies were widely backing paper Dollars with the Spanish Dollar; this is very important to fully understand the history of the US Dollar. In 1792 Congress defined the United States Dollar based on the silver content of the Spanish Dollar, which was roughly 24 grams of silver, or about 0.75 ounces. In early US history, coins were still made of silver and thereby ensured the currencies backing with something tangible. Paper Dollars were also widely in use and were backed by both silver and gold. It wasn't until 1965 that the last US coins lost their silver content which was replaced with base metals. This is something to always keep in mind when you find an old looking dime or quarter in your change. By quickly checking the coins mint year you can tell if it contains silver. If the mint year is before 1965 a quarter is worth about $6 and a dime about $2.50 at today's spot silver prices. As already mentioned, at the birth of the nation the US Dollar was defined as the same weight of silver as the Spanish Dollar. But the US Dollar was predated by a rather disastrous Continental Dollar which was introduced by the Continental Congress after the revolution began in 1775. The Continental depreciated very badly due to hugely inflationary monetary policy, giving rise to the saying "Not worth a Continental", which is a very improtant part of the the history of the US Dollar. In order to create a stable currency that held its value, the Mint Act of 1792 defined the already stated ratio of one Dollar being defined as a weight of roughly 24 grams of silver. The Mint Act was then followed by the Gold Standard Act of 1900, which essentially abandoned the bimetallic standard of gold and silver, and defined the Dollar as 1.505 grams of gold, or one ounce of gold being equivalent to $20.67. During the 19th century there were two significant time periods where the backing of the Dollar with gold was abandoned. The first was during the War of 1812 fought against Britain and second time was during the Civil War starting in 1862. On both occasions Dollar bills were issued that were not backed by gold resulting in very fast and extreme devaluation of the money in circulation. Prior to the Federal Reserve Act of 1913 there had been two attempts at setting up a central banking system: (1) The First Bank of the United States from 1791 to 1811 and (2) The Second Bank of the United States from 1816 to 1836. This was followed by an era of free banking from 1837 to 1862 and then system of National Banking from 1863 to 1913, the year the Federal Reserve was born. In recent years the Federal Reserve has been in the spot lights a lot due to the financial crisis and the actions taken by the Fed in response to the crisis. I find the name given to this central bank to be somewhat of a misnomer, as it is not a federal body; indeed it was specifically set up as a private organisation. And secondly, the reserves that it holds are essentially only government IOUs which would not have been traditionally viewed as adequate reserves to back a currency. Since the introduction of the Fed, the USA has gone through some quite tumultuous times including the Great Depression and many very severe recessions like the one that started in 2008. Under the control of the Fed, the Dollar has also changed an awful lot. In the early days the Dollar was still partially backed by gold, but that backing deteriorated as time went by. Finally in 1972, President Nixon announced that the Dollar would no longer be tied to and redeemable in gold, making it a fully fledged fiat currency. For the past 40 years now, the Dollar has not been backed by anything more than a government promise. The value of a currency is its most important attribute. There have been many periods in history where countries have fallen victim to high inflation or hyper-inflation. Imagine having a Dollar in your pocket and having to worry whether it will buy the same amount of goods tomorrow as it does today. That is why the value of a currency is so important. Unfortunately the Dollar does not have a very good track record when it comes to holding its value. One of the Federal Reserve's mandates is to maintain price stability, but if you look at the currency's value over the passed 240 years you will see how miserably it has failed. First, let me draw your attention to the table in this Wikipedia link. As you can see, from 1774 to 1910 there were some wild fluctuations in how much a Dollar would buy. The biggest volatilities occurred from 1774 to 1780 at the time of the Continental Dollar, which wasn't backed by anything, and also from 1790 to 1820 and 1860 to 1870, both times of central banking and abandonment of gold backing, which I already mentioned above. But a Dollar in 1910 bought merely 15% less than a Dollar in 1774, which is an incredible feat for a currency of a very young Nation. This would be in my books something that can be identified as price stability. For the period under the Federal Reserve the picture is quite bleak. From 1910 to 2011, the US Dollar has lost a whopping 96% of its value. This can also be seen using the inflation calculator by the Minneapolis Fed (see "What is a dollar worth?" on the right hand side). $1 Worth of goods bought in 1913 would cost $22.76 in 2011, which is the same 96% loss of value already stated. Hopefully this history of the US Dolalr has given you some new insights into something you may use every single day. Did the Glass Steagall Act repeal cause the 2008 financial crisis? 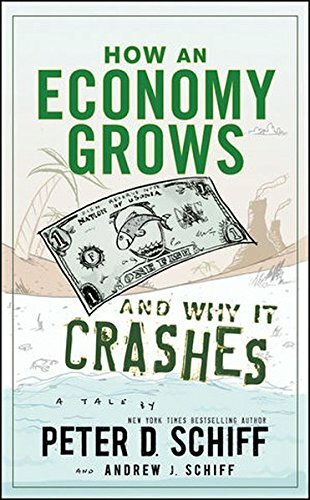 This is a book I really enjoyed that summarizes how economies develop and why things go wrong. It also provides great insights into the serious devaluation of the US Dollar described in my article. Thanks Marlando, I very much appreciate your positive opinion. Very interesting read! I didn't know that word Dollar is essentially from Thaler . Very interesting! Thumbs Up!